Although his accomplishments are known throughout the hockey world, Neal's huge popularity may never be fully understood outside of Minnesota. Not many players can say that they managed to play all of their hockey in their home state. But, for almost his entire career, Neal Broten could make that claim. He came from a small town called Roseau in a state where high school hockey is televised and watched by thousands. With the Roseau Rams in the State High School tournament he got his first opportunity to showcase his talents. They never won the title, but the kid with amazing talent would go on to bigger things. Like most of the state's top prep players he choose to attend the University of Minnesota. As a freshmen he was named WCHA rookie of the year and helped the Gophers reach the NCAA championship. In the final game against North Dakota he scored on a incredible effort as he side stepped one defender, fell to the ice from a check by another and chipped the puck over a sliding North Dakota goaltender for the game winner. His coach, Herb Brooks would later say, "He's the best player I ever coached at Minnesota." The next year Brooks selected him to play on the 1980 U.S. Olympic team. The entire country looked on as his team shocked the world and won the Gold Medal. After the Olympics, Broten went back to the University and simply had an incredible season. He was named to the NCAA All-American squad and was the first recipient of the Hobey Baker Memorial Trophy as the country's top player. Playing alongside of his brother, Aaron, he helped lead his team to the NCAA championship game where they were upset by Wisconsin. In total, he recorded an amazing 142 points in only 76 games. The North Stars knew of Neal's ability for a long time and they were determined to get him in the 1979 Entry Draft. But, Lou Nanne was sure that Edmonton would pick Neal before the Stars turn came up. So he made a deal with Glen Sather that gave them back tough guy, Dave Semenko, in return for a pick order swap. It worked well for the Stars. They managed to get Craig Hartsburg, Tom MacArthy and Neal Broten all in the same draft. Neal signed his first pro contract late in the 1981 season and was immediately inserted into the North Stars lineup. His speed fit in complemented a squad alread known for their fast skaters. The Stars advanced to the Stanley Cup Finals only to lose the NY Islanders in five games. For the next five years Neal's star would shine. He was runner up to rookie of the year, Dale Hawerchuk, in 1981-82. He scored 405 points in his first five seasons and led his team in scoring in three of those years. The entire line of Broten-MacArthy-Ciccerelli was invited to play at the 1983 All-Star game. In 1985-86 he scored a career high 105 points which marked the first time that a U.S. born player has ever reached the 100 point mark. 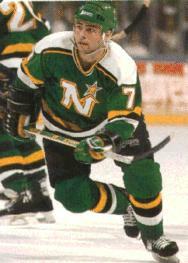 Misfortune struck Neal and the Stars in 1986-87 season. During an October game in Detroit Neal Broten picked up a pass and broke toward the net when Lee Norwood of the Wings checked him from behind. He slid into the boards hard and badly injured his shoulder. Broten came back to play later that season, but he injured the shoulder again. The Stars missed the playoffs for the first time in eight years. After the injury, Broten's game eventually evolved into a more defensive style. His scoring was down, but he became one the NHL's premiere penalty killers and he was often seen playing the point on the powerplay. In 1989, he was paired with Mike Gartner and Brian Bellows and for the first half of the season, they were one of the hottest trio's in the league. The miracle season of 1991 saw the Stars advance to another Stanley Cup Final and Neal played a big part in it. The North Stars aggressive play and potent powerplay left them only two games short of winning it all. Neal finished ninth in playoff scoring with 9 goals and 13 assists in 23 games. The Minnesota fan's loyalty to Neal was unconditional. A contract dispute in the summer of 1991 turned Broten into a hold out. After starting the season with Preussen in the German League, his return to the lineup was met with a standing ovation from the fans. Although he probably had his worst season that year, trading Neal was unthinkable as far as Minnesotans were concerned. With the franchise now in Dallas Bob Gainey dealt him to New Jersey for Corey Millen just prior to Neal's 1,000 career game. The trade turned out to be a blessing for the 15 year veteran as he won his first Stanely Cup. During the playoffs he scored some key goals including an overtime winner in the Conference Semi-Finals. Neal Broten is a true hockey legend. His unique accomplishments make him a serious contender for the Hall of Fame. Here's a few of his career highlights.